← Is This a False Alarm? This is Chapter 3 of my booklet that I am working on with the help of folks from TheOilDrum.com. Chapter 1 can be found here; Chapter 2 can be found here; a PDF of Chapter 3 can be found here. A number of analysts are saying that peak oil is here now (see Chapter 1, Question 8). Suppose they are correct — what kind of changes can we expect to see in the years ahead? In this chapter, we will look at the implications of peak oil now — how we can expect oil production to change between now and 2030, and how this decline in production is likely to affect the economy. While there are many who believe that peak oil is still a few years away (the newsletter of the Association for the Study of Peak Oil and Gas of Ireland predicts a peak in 2011, for example), this analysis will assume that the peak year is 2006, with the decline starting in 2007. If this assumption turns out to be a little early, the worst that will happen is that we will be a little ahead in our planning. 1. If peak is now, how much of a decline in world oil production can be expected in the next few years? The first of the projections we call the “symmetric” projection. It simply assumes that oil production will decrease in the future in a manner similar to the way that it increased in the past. This method assumes that 2006 is the peak year; 2007 production will be equal to 2005 production; 2008 production will be equal to 2004; and so on. Thus, the future is expected to be a mirror image of the past. The second projection is what we call the “analyst average” method. Here, we average five projections assuming peak in the 2005 to 2007 period – two made by Ace, one made by Bakhtiari, and two made by Robelius. We have adjusted all of the projections to a “total liquids” basis for this comparison (that is, including ethanol and other liquid fuels that are similar to oil), so that they are comparable to each other and to the historical data. 2. 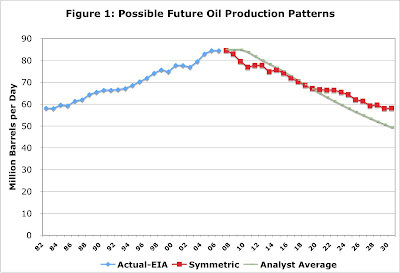 How likely is it that future production will follow a pattern similar to Figure 1? The forecasts shown are only rough approximations. Actual production could be higher, especially if there is a major technology breakthrough. Such breakthroughs take a long time to widely implement –an average of 16 years, according to a recent report by the National Petroleum Council–so the benefit occurs fairly slowly. Another possibility for increased production is an increase in an alternative fuel, such as coal-to-liquid. Such an increase might make the decline somewhat less steep. There is also a significant risk that future production will be lower than indicated. Social unrest can be a problem in countries with declining production, leading to pipeline attacks. Oil fields may not be developed because their owners lack the necessary funds for investment or the technology required to develop the fields. Some countries may choose to limit production, so as to save oil for later. Also, there is some evidence that newer technology may keep production in a field high until close to the end, then suddenly drop off. If this phenomenon is not adequately reflected in the projections, the estimates of future production may prove to be too high. 3. It seems like it is really the amount of oil per person that makes a difference. What kind of change in oil production is expected on a per capita basis? The number of people in the world has been rising at between 1% and 2% per year. 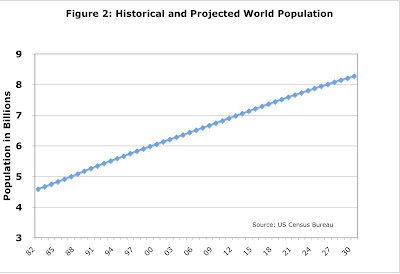 A graph of historical and expected future world population based on US Census Department estimates is shown in Figure 2. If we use the information in Figures 1 and 2 to calculate oil production per person, the result is as shown in Figure 3. On a per capita basis, the amount of oil produced has been approximately level, at about 4.6 barrels per person, between 1982 and 2006. The forecasts show that the amount of oil per person is expected to decrease to approximately 2.0 to 2.5 barrels per person, by 2030. 4. 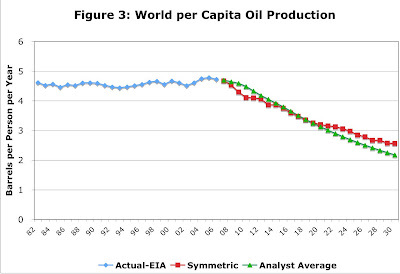 Does a decrease in per capita oil production really make much difference? I have heard oil represents only a tiny fraction of world revenue. There is a surprisingly close relationship between the amount of oil consumed and a country’s standard of living. 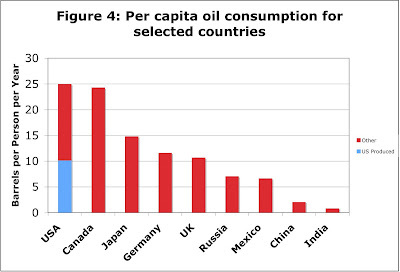 Figure 4 shows a comparison of current per capita oil consumption, for selected countries. Of the countries shown, the United States has the highest consumption, at approximately 25 barrels per person per year. (A barrel is 42 gallons, so 25 barrels a year is 1,050 gallons, or 2.9 gallons per day). Canada is close behind, with about 24 barrels. Germany and the United Kingdom are at a level roughly half of that of the United States, partly because they use more public transportation and partly because they drive smaller cars. Mexico and Russia both have per capita consumption of about 7. Note that this is still above the world-wide average per capita consumption of 4.6, from Figure 3. China and India have the lowest per capita consumption of the countries shown – approximately 2 barrels a year for China and 1 barrel a year for India. Based on this comparison, there is a huge difference among countries in the amount of oil used. Figure 4 also shows a breakdown of US oil between US-produced and imported. If we consider only US-produced oil, oil production of the United States is about 10 barrels per person per year – close to the level currently used by Germany and the United Kingdom. 5. If world oil production decreases as shown in Figures 1 and 3, what impact will this have on the amount of oil the US consumes? The US currently imports about 60% of its oil supply. The big question with respect to future US oil supply is how much oil we will continue to import in the future, when world supply begins to decline. 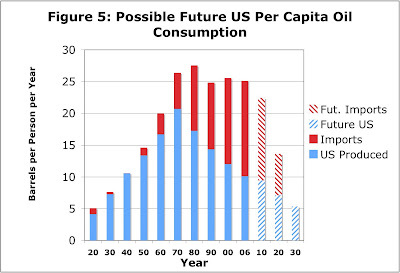 Figure 5 shows one possible outcome, on a per capita basis. • Will a free market in oil continue the way it does today, when demand is much greater than supply? • Will oil-producing nations keep a disproportionate share of the oil for themselves and their allies? • Will the US insist on importing enough oil to fuel its SUVs, when some people are literally starving to death, because their country cannot afford oil for tractors and power plants? We show a worst case scenario for 2030, with imports disappearing entirely. (If imports continue, oil availability in 2030 is likely to be higher). If imports disappear, a rough estimate is that US oil production will be about 5 barrels per person per year in 2030– a little lower than the current level of 7 for Mexico and Russia. Efficiency advances and other mitigation efforts will presumably provide some benefit, so that the standard of living might be similar to, or somewhat higher than, the standard of living of Mexico and Russia today. The 5 barrels per person per year in 2030 is approximately equal to the US’s oil consumption in 1920 — a very different world than today. 6. Is the decline in availability of oil the only problem the world is likely to face in the years ahead? No. With all of the years of growth in population and economies, we are reaching limits in many respects. • Climate change As the result of man’s activities, and in particular the growing use of fossil fuels, the world temperature is rising. Many are now saying that the use of fossil fuel should be limited – particularly coal. In North America, coal is often thought of as a possible substitute for oil, because it is in reasonably good supply and the technology for coal-to-liquids exists. Climate change issues make this substitution more questionable. • Metal shortages Quite a number of metals are now in increasingly short supply – including copper, platinum, and uranium. Some have suggested that uranium shortages may limit nuclear expansion capabilities, but this is disputed by others. • North American natural gas A shortage of natural gas in North America starting in a few years appears to be a significant possibility. Natural gas from conventional sources is in increasingly short supply. Gas from shale, which is a major “unconventional” source, is looking increasingly non-economic. Liquified natural gas (LNG) from overseas is sometimes thought to be a substitute, but a lack of investment in overseas facilities to process LNG is likely to limit its availability. • World food supply and fresh water World food supply is under increasing pressure from competition from biofuels, shortages of fresh water for irrigation, crop failures due to climate change, increasing soil degradation and growing world population. Inadequate fresh water is a serious issue in its own right. 7. What are the immediate impacts of an oil shortage expected to be? As one might expect, an oil shortage is likely to result in higher prices of goods that contain oil or use oil in their processing. Gasoline, diesel fuel, and residential heating fuel will of course be higher priced. Food will also be higher priced, because a considerable amount of oil is used in growing the food, processing it, and transporting it to market. Other types of energy are likely to rise in cost as well, as people shift to alternative fuels. The inflation rate is likely to rise. While it is not as obvious, It is also likely that there will be actual “outages” of some oil-related products. Gasoline stations may be without gasoline in some areas, particularly when a nearby refinery is temporarily not available because of a storm or unplanned maintenance. Residential heating oil may be difficult to find in some locations. Asphalt may not be available for paving roads. We are already starting to see a few situations like these, because supplies are stretched tight. If gasoline or another product is temporarily unavailable, there are likely to be indirect impacts as well. Schools may close because diesel is unavailable for buses, and factories may close for lack of a particular part. Liebig’s Law of the Minimum says that a process is limited by its least available resource. If oil is not available, even temporarily, economic activity can be seriously impacted. 8. What is the impact of oil shortages on the financial markets likely to be? •	End of the growth paradigm. Economic markets now expect continued growth and expansion. With declining supplies of oil and other necessary resources, this expectation will need to change to a steady state, or even to a planned decline. •	Declining credit availability. Debt is provided with the expectation that an individual’s or organization’s income will grow, or at least stay level in the years ahead. If this assumption no longer holds, a shift from the very loose credit standards seen in recent years to extremely tight credit seems likely. A recession or depression is likely to ensue. •	Declining stock prices. The value of stocks reflects the expected future earnings of the company. If these earnings are expected to stop growing, and perhaps shrink, the value of the stock can be expected to decline. •	Deflation and/or Inflation. A reduced supply of oil may lead to inflation, as existing monetary supplies “chase” fewer and fewer goods. Also, countries may adjust monetary policies to encourage inflation, if it becomes too difficult to pay off debt in a declining economy. There may also be huge deflationary pressures, as the value of stocks and other investments decline, debt becomes less available, and the economy shrinks. •	Reduced interest in insurance and other financial products. Volatility in monetary supply, declining values of stocks, and problems with the debt markets will all make insurance and other financial products less attractive. •	Declining globalization Declining living standards in third world countries, declining availability of commercial airline flights, increasing cost of global transportation, and increasing volatility of currencies are all likely to act to reduce globalization. 9. What types of jobs are likely to see growth in the years ahead? •	Small businesses, selling goods close to the customer. •	Recycling of all kinds, including clothing and parts from no-longer-wanted buildings. •	Remodeling homes to make them more energy efficient and to accommodate more people in the same space. •	Food production will require more workers than the few farmers we have today. Some may be more like gardeners. •	Energy related jobs – As energy becomes more and more difficult to obtain, a larger and larger share of workers will need to work in this field. •	Scientist and engineers – Needed to develop more energy-efficient approaches. In agriculture, to develop approaches requiring less energy and less fertilizer, pesticides, and herbicides. In manufacturing, to design factories in this country, to replace factories making goods which can no longer be imported from oversees. •	Manual laborers – As energy becomes more and more expensive, manual labor becomes a more attractive alternative. 10. What are some of the challenges in the years ahead expected to be? •	How do we adapt the transportation system to the new lower supply? Increased fuel efficiency standards for vehicles are unlikely to be enough by themselves. What else can be done without excessive cost– car pooling? bicycles for short trips? expansion of public transportation programs? more use of distance learning and work-at-home programs? Does it make sense to plan for battery operated vehicles? •	How do we plan for a declining economy? Companies will not want to build a factory, if they know that it will need to be abandoned in ten years for lack of fuel. Oil companies will not want to build pipelines, if they know they can only be used for a short time. •	How do we deal with greatly reduced financial services? If mortgages become unavailable, how do we deal with home ownership? If loans are unavailable, how do businesses plan new factories? •	How do we find adequate resources (both capital and physical resources) to handle all of the investment that is needed in infrastructure? The only resources we have available are those we (1) mine, grow, or otherwise produce; (2) recycle; or (3) import. These resources are needed for other uses as well, including transportation and food. •	How do we find substitutes for the many chemical uses of oil – textiles, building materials, pharmaceuticals? Or do we give priority to oil for these uses? •	How do we protect the food supply? Should farmers be given special access to fuel, through some sort of rationing program? Should people be encouraged to start gardens, to supplement the food supply? How should we train people in low-energy agricultural techniques? Will it be necessary to break up large farms into units that are manageable with less energy? •	How can we avoid future shortages that are likely to have wide-ranging effects? For example, some people are concerned that we may not continue to have enough asphalt to maintain roads. Is this really a problem, and how can this be avoided? How can we circumvent shortages of metals needed to make cars and other consumer goods? •	Resources are unevenly divided. People will want to move to areas with greater resources. How do we deal with the conflict that may ensue? Do we forbid immigration all together? How do we keep countries from fighting over limited resources? This entry was posted in Financial Implications, Introductory Post, Planning for the Future and tagged nuclear, oil, peak oil. Bookmark the permalink. 8 Responses to Peak Oil: What’s Ahead? People realize that farms need labor on hand to work the fields and make up for the loss of machine power. So, where to house the workers? I anticipate city structures being torn apart for materials to rebuild smart housing on farms & available land – dorm style, make it livable and fun to work on the farm. Solar film breakthroughs, wind power, rainwater catchment systems. In the event of fast shortages, how to get materials from city to farms? Team Pulling – break down old office cubicles, whatever, and load materials onto truck flatbeds. Teams of people pulling, together. Bicycle teams by their side along the journey, encouraging, cooking, watering, take care of the laborers. On the transport journey, feed them, quarter them. Transport materials from city to land. See every shipment off from the city with music and fanfare. Welcome every shipment to the farms with music and fanfare – each stop and camp along the way, a celebration. Call it a team effort Utopian view of collapse. I like hearing that there is still a strong interest in Uranium (as well as a shortage). Investing in Uranium might pay off bigger than i had originally thought. I recommend this report to you Gail, its all about Uranium and very helpful. Gail, I did a bit of thinking about your question one a few years ago and, as a result, published Out of Gas: A Systems Perspective on Potential Petroleum-Fuel Depletion through Pegasus Communications. The text of the column is intended to attract people’s attention; the real content is in the downloadable simulation model. My initial, naive thought (before doing the model) was that the decline would mirror the rise, much as the symmetric projection indicates. If you run the model, you’ll see that it shows a much faster drop-off. That model is not a prediction, as you’ll know if you’re familiar with system dynamics models. It does indicate how the system might respond, though. The key point is that our demand continues to ramp up, driven by the desire to drive, the desire to grow industry, expanding populations, and the like. Thus the raw demand a decade after the peak would seem to be greater than the raw demand a decade before the peak. That larger demand would seem to draw down the remaining stock of crude rapidly, leading to a consumption drop-off that’s much faster than its rise. There is a variable in the model called “Impact of Scarcity on Consumption,” and the model results seem somewhat sensitive to its shape. What that model showed me was that the potential exists for shortages to show up much faster than people might expect. Don’t take my word for it, though; try the model, and try your own, as well. Straightener says : I absolutely agree with this ! Great article! Hello everybody. I agree that there will be a great slide backwards in humanity’s standard of living as world oil production slides off of the “peak plateau” or whatever one calls it, felt more acutely the more developed a country is as it will be a greater contrast with what they’re accustomed to nowadays. As I was reading this thought-provoking article an idea occurred to me that perhaps in the future people will go back to coal-burning steam engines and have steam-powered tractors for agriculture, steam-powered trains etc., basically going back to before the internal combustion engine. Granted this would be disastrous from a carbon emission point-of-view considering how much the world’s population has grown since steam engines were last the norm, but is it possible that it could end up that way regardless, with a higher standard of living (over being able to use only manual labor I mean) in the (then-)current time considered a higher priority than not destroying the environment in the (relatively-)longer term? I’m rather new to the whole Peak Oil discussion so this could be something that has already long since been thought of and rejected, I don’t know. But it just popped into my head when I was reading the article. Actually burning coal for steam engines, or people burning coal at home for heat, in any quantity would not be any more pollution then burning it for electricity now. There would probably be less coal being burnt overall, and that is what matters. We burn coal to generate electricity. You have all the infrastructure to build, that takes energy, more fossil fuels gone into that, all the steal, all the transportation of the raw materials etc. Then you have the maint side of it, continued ongoing never ending repairs and replacement of parts. Then you have the fact that you have to burn say………one megawatt worth of coal to produce say 900 kilowatts of electricity because you are losing energy in the conversion process. Then you have the loses down all those lines, you pump out the 90 kilowatts but only 700 kilowatts reaches the end user. Then you have loses in the appliance…..lets say a heater…..it gets to the point where half the energy of the coal burnt generating electricity is lost, wasted. If you burn coal and use it’s energy directly………in the same place….it is much more effiecient. For instance……..you might have to burn 1 tonne of coal generating electricity to provide for heating tne cooking and say hot water for 1 house for a given period of time…..if the house burnt the coal on site, and used that for heating, cooking and hot water they would use half as much. This is fact……and using half as much would mean half the total pollution. The fact is that all we have done by using electricity is move the pollution away from our noses, and eyes……..and double it……in some other location. People just won’t get that through their thick heads. Burning wood for stoves, heating etc……at home…..is far more green then using gas………less polluting, and renewable, and it is the only energy that is renewable. And before someone says CO2, wood gives off the CO2 burning that it soaked up growing. You are only putting back into the atmosphere what was there before the wood grew, and when you grow more wood, you take it back out again. There is no fuel you can say that about accept wood. The world burnt wood for fuel since the beginning of human history, thousands of years…….never a problem……..until we started switching to fossil fuels. Wood can support and sustain a population of on earth of about 1.5 billion people, just as the land can grow food for about that many, without chemicals, pesticides, fertilisers etc. We are destined to return to that level of population, and return to burning wood, after all the fossil fuels are gone……..it is the only sustainable fuel……..everything else will run out sooner or later. Sorry to smash your dreams of a Jetsons or Star Trek type of future, but the human race had a party on fossil fuels, and it’s nearly over……..back we go to where we were……..about 1800s…….and thats the life we will have from then on…….till the end of the earth. And before anybody says, but technology will save our arse……….no it won’t…….technology so far has increased per person energy consumption on earth…….never in history has increased technology resulted in net per person decline in consumption. Technology does not, and never has, and never will, create energy, it uses energy, it does not create it. I suppose we will have it better then the 1800s in some ways. We won’t be able to use electricity for our wants though, just our needs. Needs being, emergency life and death things. We will always be able to generate electricity for must have things where the economy of the cost of generation don’t matter. Even if we have to get the whole family on exercise bikes for an hour a day peddling to charge up batteries just to keep the fridge going and have a couple of hours of light after dark……we will still be able to do that……..but air conditioning……….watching TV…….DVDs……sitting up all night with lights on………electric heaters……hair dryers…….electric this and that…….all extinct and things of the past before this century is over.